This post contains Amazon affiliate links… if you use my links, I will make a little money, but it won’t cost you any extra 🙂 Thanks for supporting my blog! And what project is that?? 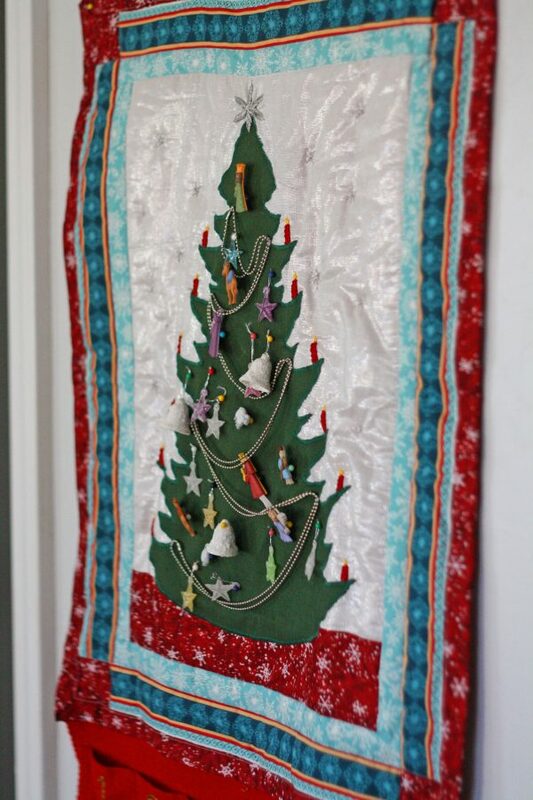 When I was a kid, my aunt made my mom an advent quilt very similar to this one. Those felt pockets hanging below the quilt? Those are the original ones my mom made to use 🙂 I made my own quilt, though, modeled after hers! It’s a very neat way for your kids or grandkids to countdown to Christmas! You start on December first by hanging a mini ornament on the tree until Christmas Eve when the last ornament gets hung. You end up with a fully decorated tree and empty pockets. We use a combination of mini ornaments I found at Wal-Mart years ago and some Christmas buttons that I picked up at Hobby Lobby. I use straight pins to attach them to the quilt (the heads resemble ball ornaments). My sister uses mini safety pins on her quilt. I personalized my quilt, so it’s slightly different from my mom’s or sister’s. For instance, I quilted it “in the ditch” on all the seams, but then used silver thread on the white part to tie the rest of the quilt. I also embroidered a silver star on top and embroidered candles on the branches. I encourage you to decorate your quilt however you want! I bought the silver chain and tacked it onto the tree for “garland” but you can use whatever you want or leave the garland off! 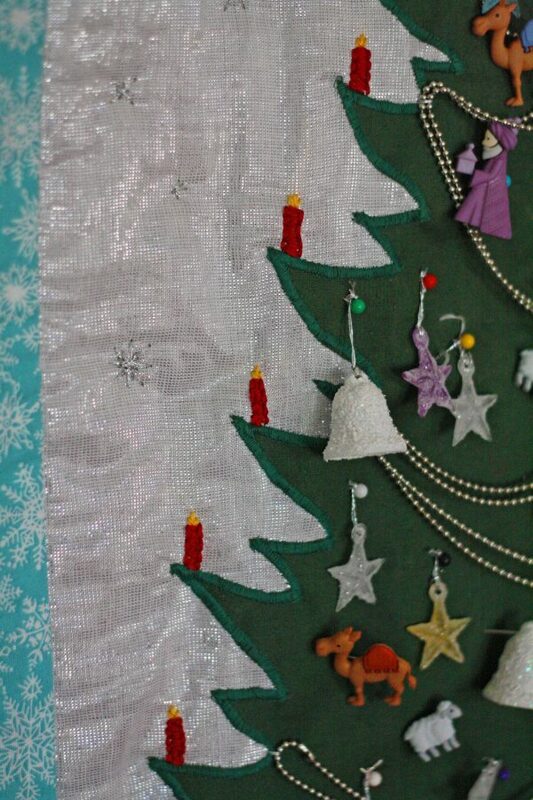 See how I appliqued the tree on? 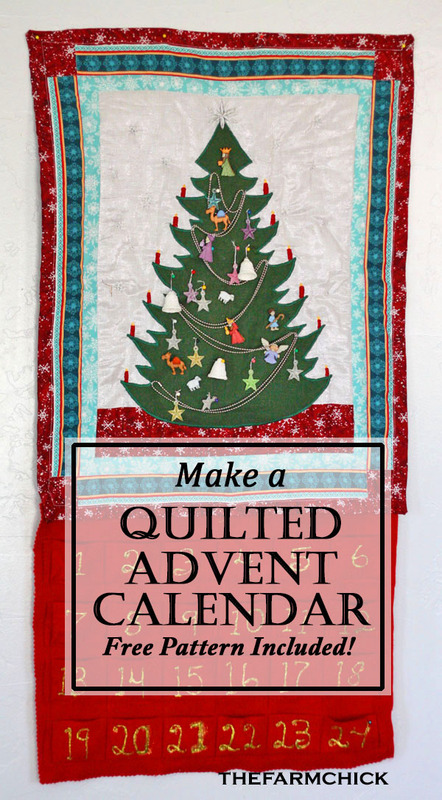 Without further ado, here are the instructions and plans for making your own quilted advent calendar! quilted advent calendar diagram <—— Print out this pattern for exact sizes and measurements! Step 1: Gather your fabrics together. This makes a wall hanging that is approximately 22 inches x 17 inches. It doesn’t take much fabric and you may have scraps that you can utilize for this! I ended up with quite a bit of fabric left, so I made some kitchen Christmas curtains out of it. Step 3: Cut out your quilt pieces, including your tree. Print the out the Christmas Tree pattern below unless you want to design your own tree, which is perfectly acceptable, too! My tree is about 14 inches tall and 10 inches wide at the base. The diagram pattern is actually a half of a tree. And it’s on two pieces of paper, so you’ll need to cut and tape it together on the dotted lines. 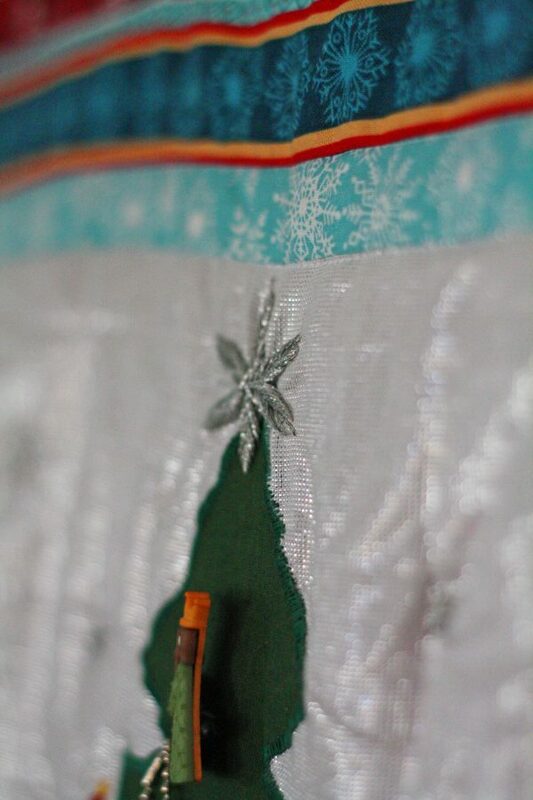 Fold your tree fabric in half and lay the pattern on the fold. That way both sides are symmetrical. Remember folding a piece of construction paper then cutting out a heart when you were a kid? Yeah, same idea here. Step 4: Start assembling your quilt. I’m going to assume you know how to piece a quilt top, but in case this is all new to you, I highly recommend tutorials by the Missouri Star Quilt Company! I use them for all of my quilting questions 🙂 You will use 1/4 in seams on everything. 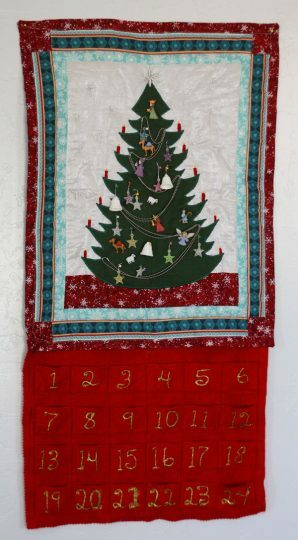 Step 5: You can applique your tree on after you have the middle part of the quilt assembled (on mine it’s the large white background with the red “tree skirt” underneath). Step 7: Build the larger outside border with your little corner blocks then attach to quilt. Step 8: Assemble your quilt now with quilt batting and the backing fabric of your choice. My sister highly recommends quilt basting spray to attach your batting to your two layers of fabric. Step 10: Bind your quilt. You can do it the regular way and cut out your binding and attach it, or you can do the lazy way (which is what I did!) and fold your extra backing fabric over the front and stitch it down. Check out this awesome tutorial from the Missouri Star Quilt Company for a great binding lesson. Congratulations! Your quilted advent calendar is done! You will need to make the pockets for your ornaments! My mom made hers out of some red felt. It is simple and quick. Her main piece is the width of the quilt (about 17 inches) and 13 inches long. She then took felt strips, attach them around three sides then sewed vertically to make pockets. After that she took gold fabric paint and wrote the numbers 1-24. I attach the felt pockets to the quilt using straight sewing pins, but you can permanently attach it if you want by sewing. Now you can be a lot fancier than this, but as kids, we didn’t care that the pockets were felt with handwritten numbers. Don’t forget to get enough mini ornaments to fill those pockets! I found these on Amazon…. There you have it! Trust me, you and your family will love getting this out every December first and start the countdown to Christmas! What have you used in the past as an advent calendar? Any childhood Christmas traditions that you’ve continued with your own kids?? 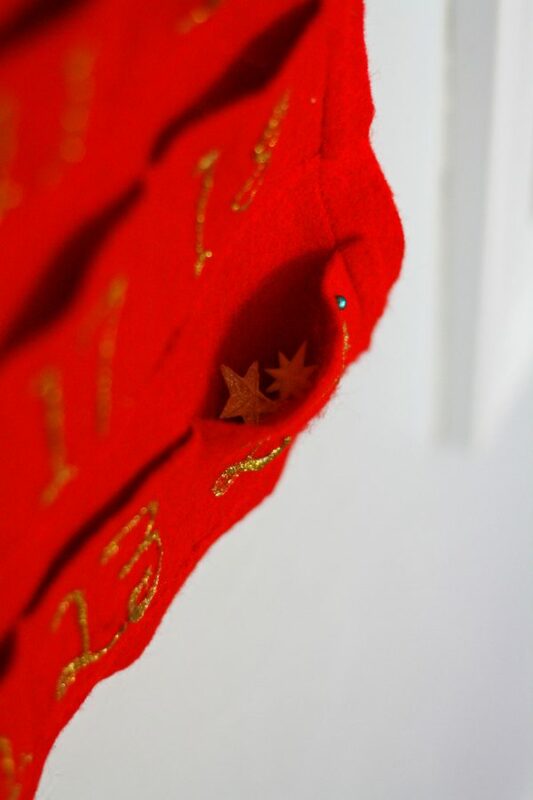 Send me pictures of your own quilted advent calendar! I’d love to see what you all come up with! You can email me at melinda@thefarmchick.com or tag me on Facebook!